제품특징 : Various Types of bigger sizes can be manufactured depending upon the quantity of the sample. 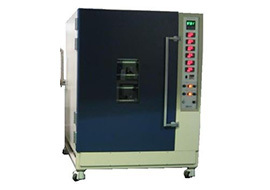 Big-sized vacuum chambers are manufactured based on the clients' usage and request. Temperature range and heating methods are also easily manageable. Non-customized sizes can be manufactured as well. All our products are designed and manufactured according to KS-6750 standard. ※ Other specifications are always negotiable with us.